On the off-chance that any Labour politicians are looking for a clear line on Grammar Schools they might want to read on. I’ve heard a number of them getting tongue tied today when asked the simplest of questions (“would you allow existing Grammar Schools to expand” etc.) and it seemed quite strange to me to be so confused over something that is, in the end, quite simple. Let’s do the easy bit first. It is hard to question the data we have that says Grammar Schools do not aid social mobility, they do not perform better than schools with similar intakes, that early selection depresses performance of lower ability children, that any semblance of accuracy in the selection is ephemeral at best and that kids who fail their eleven plus do better than those who succeed and go to Grammar School. You can look here, here, here, here and here. 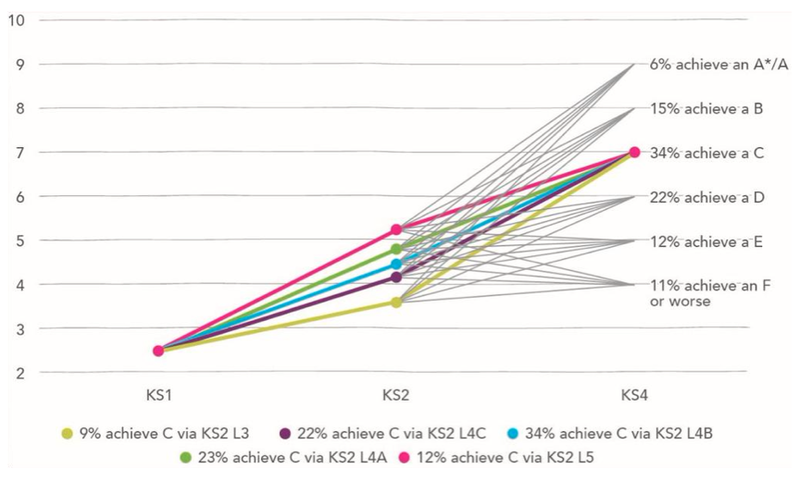 On the last point I would also put into evidence this wonderful construction from @edudatalab which shows that only 10% of pupils actually follow any form of expected pathway. Early assessment is rubbish as a means of predicting the future outcomes of individuals. So, Labour politicians. You don’t have to duck or weave. The evidence is fairly clear. Grammar Schools are not as effective as they are cracked up to be, because they can’t be. Further evidence for that is to watch just how Tories answer questions about their performance. They are incredibly careful not to compare like with like. At this point it’s probably also helpful to be very clear – Grammar Schools are, in the main, good schools. They educate their pupils well. It’s just that they aren’t magic learning factories. All they are doing is selecting what they think are the best kids and then educating them the same as any other school would (the House of Commons Library is quite compelling on this) though often, it has to be said, not as well. Then we come to the simpler thing. The law is very, very clear. No new Grammar Schools. Let me make that point again. NO. NEW. GRAMMAR. SCHOOLS. Tories can say expansion all they like. They can say the school will have the same uniform, headteacher, heads of department as long as they like. Those things do not matter when the new school will be 10 miles away from the current one. It does not pass any kind of reasonableness or smell test. It is, I repeat, a new school (pro-tip: call it that at every opportunity, it’s what it is, a NEW school). The line of attack here is simple. When it suits, Tories are prepared to ignore the law if they think it will help them to retain votes. They are gutless. They haven’t the gumption to try to change the law. As they do with the economy, with the health service, with the homeless and the poverty stricken, they are playing politics with the truth. That is to say, they are being completely dishonest. So the line is very simple. No new Grammar Schools. They do no better than non-Grammars for the children they take. And they depress outcomes for the children who don’t go to them. Consequently, they have no beneficial impact on the educational system and should not be allowed to expand. The current and future children of Kent and Bucks and Lincolnshire and all the other areas with Grammars deserve no less. Why should child A be condemned to a worse education because the parents of child B believe a Grammar School is better? This is the message that needs to go out. Selection does not work. It is bad for those not selected and there is no evidence it is good for those that are. THAT’S WHY WE PASSED A LAW PREVENTING NEW SELECTIVE SCHOOLS! Unless of course, the reason you want to select has nothing to do with the academic outcomes for children. And who is going to admit to that? The should be no grammar schools, or selective systems (my opinion). Lest the following be misinterpreted. Disadvantaged children do less well in a system of selective education. But in Kent, there are grammar schools and selection at 11. They are legally entitled to have this system. No political party is prepared to abolish grammar schools and selection. 40% of the girls at Weald of Kent travel 10 miles to get there from Sevenoaks, having passed the 11 plus. It is their nearest grammar school. There should be no 11 plus, but there is one. Opening up an annexe to Weald of Kent in Sevenoaks should therefore theoretically stop many girls being driven/bussed back and forth across Kent every day. This sounds logistically sensible. Don’t we just love our educational politics to be grey in shade? Boys in Sevenoaks are not addressed by the solution selected. So we now add gender discrimination into the mix. And to resolve this issue, which of the above statements should we be addressing? I’ve warned you before about adding nuance to the debate! My response would be simple one. Parents and children are making a choice to take the 11+. No-one is forcing them to do so. They take that choice in full knowledge of the consequences given that the law clearly states no new grammar schools. They cannot then cry foul afterwards. If they have energy to put into lobbying to improve their childrens education then perhaps it is better that they do when in full receipt of all the information rather than the partial selection they currently get.